The modern, stylish Roband Grill Station is available in six or eight slice size models and sets the benchmark for commercial contact grills. The versatile unit rapidly toasts sandwiches, paninis and focaccias, in addition to producing beautifully seared and grilled tender meat, poultry and fish. Featuring elements embedded directly into smooth, high-pressure die-cast aluminium plates, the cooking surface produces an even, extremely efficient heat transfer ensuring food is cooked rapidly with even colouration. 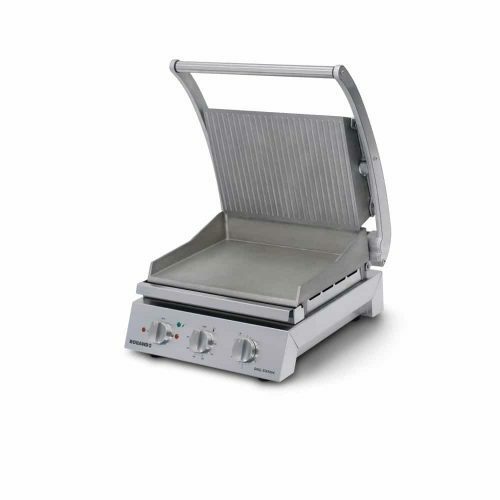 The Roband Grill Station truly is a must-have for cafes, takeaways, sandwich shops or anywhere that toasting and/or grilling is required.